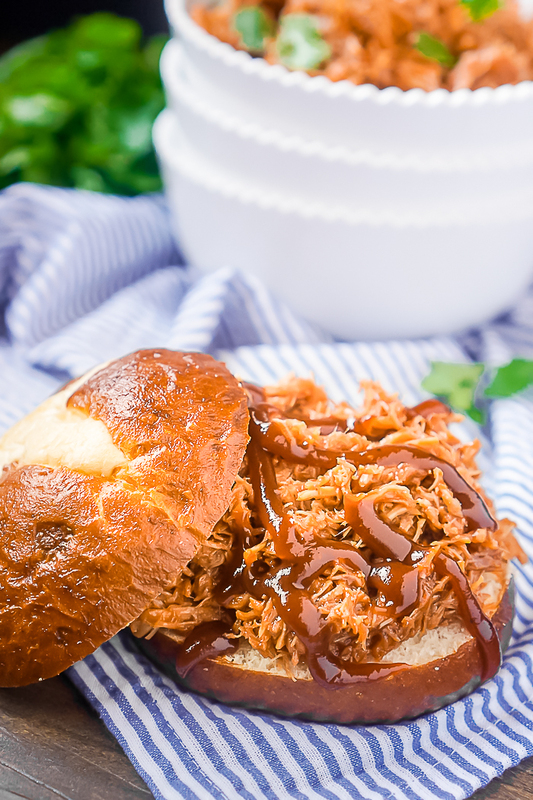 This 4 Ingredient Slow Cooker Pulled Pork Recipe is an incredibly easy family dinner recipe that is perfect for serving large groups like as game day food and as leftovers for the week! Easy 4 Ingredient Slow Cooker Pulled Pork! I first shared this recipe for 4 Ingredient Slow Cooker Pulled Pork in 2013 near the beginning of my blog journey. At the time it had quickly become one of Bryan’s favorite easy family dinner recipes, and I’m happy to report that it still is. With a little one at home now, quick dinner recipes like this are even more important. Easy family dinner recipes are essential for our healthy and our budget. When you are woken up 5 times in a night during your baby’s sleep regression, heading through a drive through becomes a really attractive choice. Even better when there are so many places that now deliver! So easy dinner ideas make sure that we don’t take the easy way out and spend more money then we need to since, you know, babies are expensive! Even better? This slow cooker pulled pork is also one of the best family dinner recipes because it makes delicious leftovers. I plan on sharing a couple new pulled pork inspired recipes in the next couple weeks. The last time I made a batch, I doubled the recipe which provided us dinner with family, leftover dinner for us, leftover lunch for us, pulled pork nachos, and pulled pork flatbread pizza. Yum! Lots of tasty ways to enjoy such an easy dinner recipe. Okay, so maybe even better is the fact that it’s easy to make a large batch for big events, too! This makes the perfect meal or appetizer option for birthday parties or family get togethers. And especially good as game day food! Prepare a batch in the slow cooker where it can stay warm once it’s cooked and shredded and put out buns, sliders, chips … almost anything really. People can make their own BBQ Pulled Pork Sandwiches or even nachos. Start by seasoning the boneless pork chops and placing them into your slow cooker. For seasoning, I use a quick sprinkle of garlic salt. Add chicken broth to the slow cooker, making sure to mostly cover the meat. Cook the pork on high for 6 hours. When done, drain the broth and remove the pork chops for shredding. It can be shredded using two forks but I also love using these Shredder Claws. 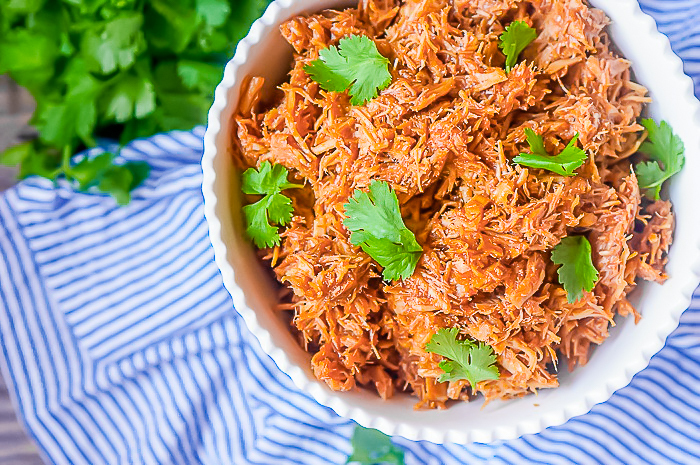 Place the shredded pork back into the slow cooker and toss with your favorite BBQ sauce for BBQ Pulled Pork which is our preferred method. If you don’t want BBQ, you can just leave it plain and put sauce on the side. Also consider trying Italian dressing – so yum! 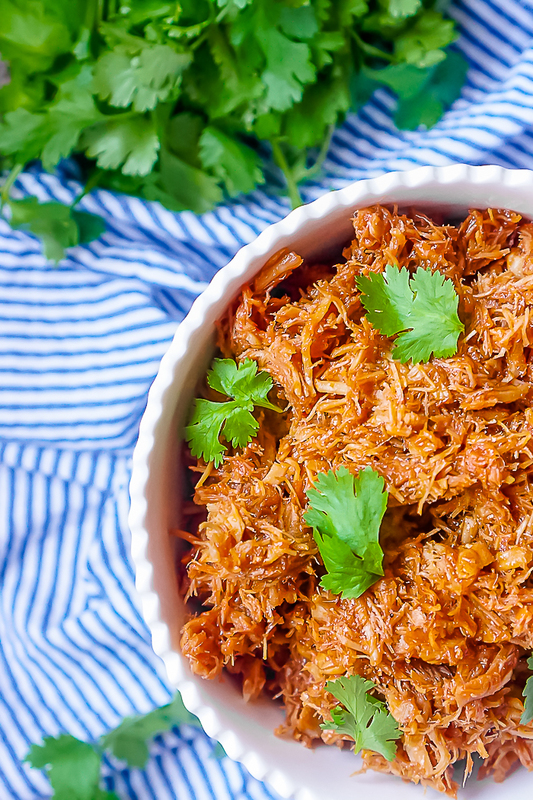 TIME TO START YOUR BATCH OF 4 INGREDIENT SLOW COOKER PULLED PORK! This 4 Ingredient Slow Cooker Pulled Pork Recipe is an incredibly easy family dinner recipe that is perfect for serving large groups like as game day food and as leftovers for the week! Toss with your favorite BBQ Sauce, Italian Dressing or even leave plain! Pour the chicken broth into the crock pot. I make sure that there is enough broth to cover most of the meat.